The Intel Core i9 for mobile has arrived and it brings native Optane support to gaming laptops for the first time. Asus has internally refreshed its powerful 17.3-inch gaming notebook to take advantage of the faster Turbo Boost, faster DDR4-2666 RAM, and Optane memory options. The chassis and core hardware features remain identical. 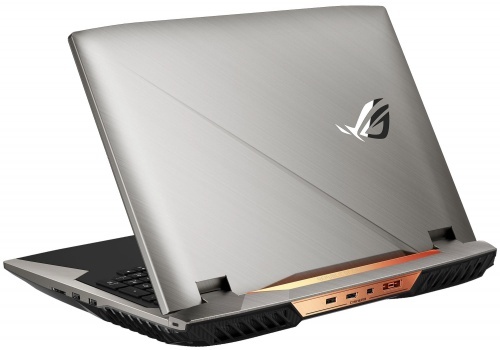 The Asus ROG G703 is one of the largest 17.3-inch gaming notebooks in the market at just over 50 mm thick. Thus, it was only natural for Asus to up the ante and upgrade the system to Intel's recently announced 8th gen Core i9 CPU to cement it as a flagship offering for gamers. The unlocked hexa-core Core i9-8950HK carries a base clock rate of 2.9 GHz with single-core Turbo Boost of up to 4.8 GHz under the same 45 W TDP as the Core i7-7820HK. Note that the base clock rate of the new Coffee Lake-H CPU is the same as the Kaby Lake CPU it replaces but with a significantly higher single-core Turbo Boost (4.8 GHz vs. 3.9 GHz). Intel is able to achieve this through its new "Thermal Velocity Boost" feature that safely elevates Turbo Boost to even higher clock rates than usual. From our experience with most notebooks, however, such high clock rates are unsustainable and only attainable for a few seconds at best due to cooling restraints. Intel could have easily called its new processor the "Core i7-8950HK", but the "Core i9" moniker is simply more distinct for marketing purposes. Other than clock rate differences, the i9-8950HK introduces native support for Intel Optane memory and two channels of DDR4-2666 RAM whereas the i7-7820HK "only" supports up to DDR4-2400. Consequently, Asus will be offering the refreshed ROG G703 with faster RAM, Optane memory, and new 144 Hz display options. The refreshed system is otherwise visually identical to the existing ROG G703. We recommend checking out our review on the outgoing G703 for more information on the notebook. The G703 with Core i9 is scheduled for launch by late April to early May and it will compete directly against the MSI GT75 and Alienware 17 in the Core i9 enthusiast gaming space.